I don’t pretend to be an expert on fashion, but I do want to share my year-round outfit formula (and the rationale behind it) for flying! Packing and traveling can both be stressful, and figuring out a go-to formula has saved me time and anxiety, in addition to keeping me comfortable in some ridiculous airport situations. T-shirt or tank top: Choose a shirt that you’re comfortable wearing on it’s own, not just a little cami that you’d be embarrassed to wear in public. This first layer is for keeping cool during that terrible hour(+) you might spend stuck on the tarmac in the stifling heat. Boyfriend cardigan: Even in the summer, planes and airports can be freezing (I’m looking at you, ORD). A long outer layer keeps you warm, and also keeps you covered, even while contorting into ridiculous positions to get things our of your under-the-seat carry-on. Cardigans are also very easy to slip on and off, either as the plane changes temperature or as you run through the airport. Skinny jeans: Or whatever pants you’re planning to take on the trip and are comfortable in, really. I choose skinny jeans so that in the winter I can wear them with my boots. Sometimes I trade out the tee and jeans for a comfy dress and leggings, but I keep the cardigan and scarf. Boots: In the winter, boots are going to take up a ton of space in your suitcase. If you only travel with carry-ons (like I tend to), you’ll want to wear your biggest piece of footwear. Just make absolutely sure that they’re comfortable and, if you have any layovers, make sure that you could run across an airport in them. Air travel is not a place for high heels. Sandals or ballet flats (and socks! ): In the summer, I simply switch out my boots for flips or flats (again, keeping in mind that I have to be able to run through an airport in them). I also bring a pair of socks and keep them accessible, in case my feet are freezing during the flight (a common occurrence in window seats). Coat: Wear/carry one in the winter — preferably one that functions as a comfy pillow. Did you know that in addition to your carry-on + personal item, you can also typically carry a coat, reading material, food and an umbrella? If your bags are full to the point of overflowing, carrying a book or two can really help! For the most part, skip the jewelry: There are exceptions to this — certainly short flights or pieces of jewelry that you wear so often that you don’t notice them. I often find myself taking out earrings or taking off long necklaces when trying to sleep comfortably, though. And you certainly don’t want to wear valuables that might fall off in transit — you’ll never find them! Just bring your jewelry in a cute container, and slip it on as the plane lands. This avoids any hassle in the security line, as well. 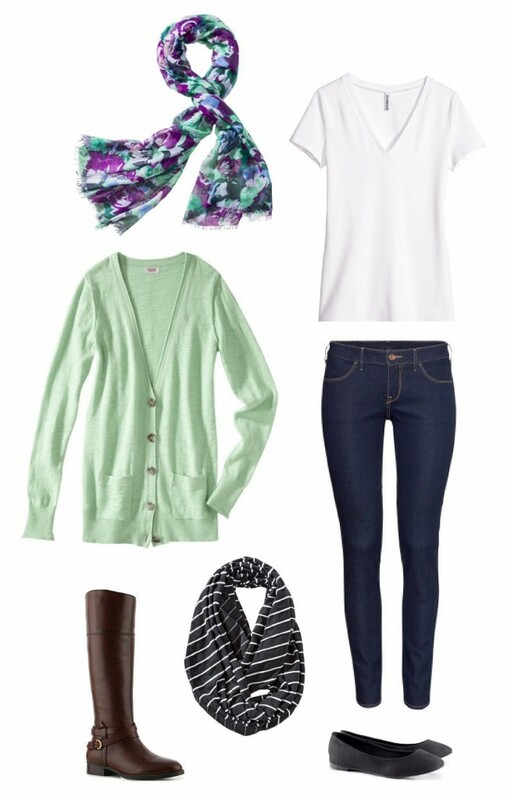 I personally own and love that mint cardigan, those boots, and those flats. I have an especially hard time finding flats that don’t cut into my heels, and I love those H&M flats! For $12.95, they absolutely can’t be beat. I can’t decide what color to get next! In the meantime: Spring Break, here I come! Any advice for the person who chronically overpacks because of not being able to predict what she’ll ‘feel like wearing’ on the future trip days?